"Fragrance of honeysuckle / Memory of early summer"
I smell very nice sweet fragrances. Before the rainy season in June. These fragrances remind me of the start of the rainy season. 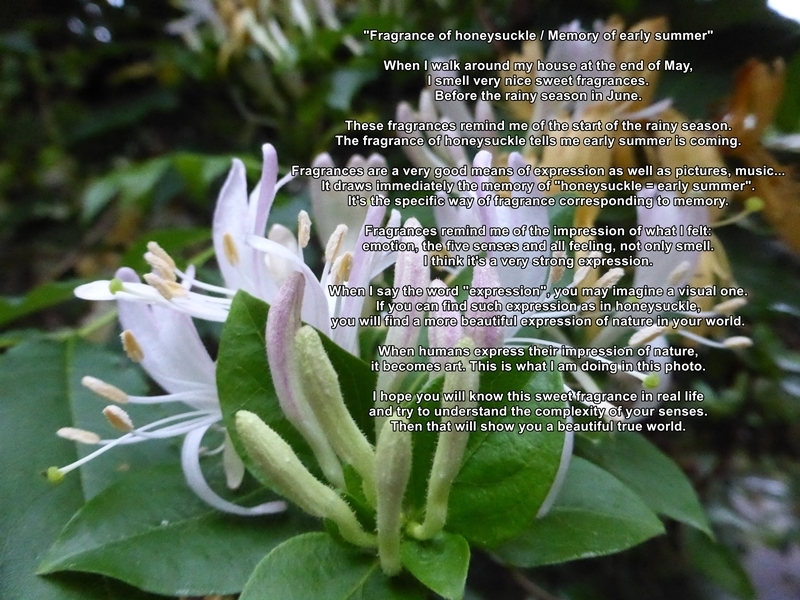 The fragrance of honeysuckle tells me early summer is coming. It draws immediately the memory of "honeysuckle = early summer". It's the specific way of fragrance corresponding to memory. emotion, the five senses and all feeling, not only smell. I think it's a very strong expression. When I say the word "expression", you may imagine a visual one. you will find a more beautiful expression of nature in your world. it becomes art. This is what I am doing in this photo. and try to understand the complexity of your senses. Then that will show you a beautiful true world.